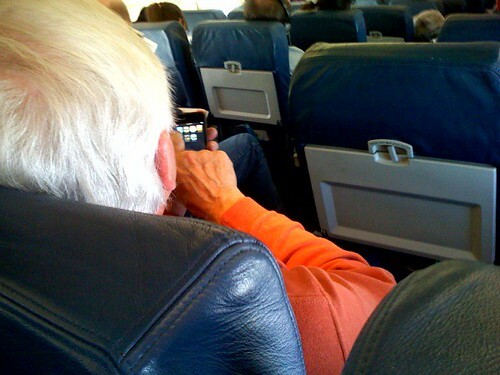 There was a Twitter conversation with Martin McKeay and Jerry Gamblin today talking about how geeks handle traveling with all our technology. Jerry suggested that Martin write a blog post, but I decided to beat him to the punch. 😉 This is part of an upcoming series of posts under the heading of Traveling Skills: The Art of Packing. In this post I’ll describe how and what I pack as a geek who travels with technology, as well as why. These are the pieces of technology I pack with me wherever I go. Basically it’s my laptop, phone, camera, earbuds and a few cables and accessories. I like to keep it simple. I keep all the cables and accessories in a clear ziplock bag so I never have to dig too far for things. The earbuds I usually keep in an exterior pocket of my bag or in my pants pocket. There are a variety of things I keep at home to support my travel kit. Most importantly are my chargers. The Nikon rarely runs out of juice, so I don’t have to worry about that. I also have extras of the cables and accessories, in case I lose one on the road I’m not without it on my next trip. I also have a battery charger and use rechargeables. They’re a bit more expensive, but worth it in the long run. All these things would be nice to have, but I really don’t use them often enough to justify bringing them along. Equally as important as what I bring is what I don’t bring all the time. These are things that are either too heavy, or used too infrequently to justify bringing. If I know the job will call for something special then I’ll bring it, but normally I try to leave as much as possible at home. Most people want to be prepared for whatever situation they may find themselves in. For geeks that means a lot of technical equipment. Phones, laptops, tablets, portable hard drives, external speakers, adapters, cables, chargers, batteries, antennas, and potentially dozens of other “can’t do without” items. And that doesn’t even include clothing, shoes, bags, books, and everything else. But all this stuff gets heavy and odds are you won’t end up using most of it. Here’s what I always ditch. Small portable speakers. I have a couple of great pairs, but I don’t use them often, they’re heavy and whenever I go to use them I find the batteries have already died. Extra laptop battery. I have replaced the battery once and it may be time to do it again. But I’d rather spend a little extra to have a fresh battery than lug an extra one around for months without needing it. Lots of camera lenses. I just use the one. It was more expensive than going with several lenses, but it’s a way more portable option. Plus, I treat my DSLR as a point-and-shoot anyway – I just want to whip it out and start snapping, not mess with lenses and such. Battery chargers. I only have one thing that requires a battery and I carry a spare. My DSLR has never run out of juice on me while I was on the road. Even on multi-week trips with hundreds of photos! Bigger flashlight or headlamp. I chose this one because it fits on my keychain, is bright and runs on a standard size battery. I don’t use it often and so it’s a compromise as compared with a headlamp or a big maglite or something. External hard drive. Do I really need access to 1TB of movies, songs, funny videos, or whatever? No. Do I need to backup everything over the course of a week? No. (See below for backing up on the road.) These things are bulky, require special cables, heavy and hardly ever get used. Here’s a tip from my article on adopting a minimalist packing philosophy: Start packing with absolutely nothing, then ask. If the answer to 3/4 is “yes” then bring it. If not, leave it. Do I know it will be difficult, expensive or impossible to buy there? Am I positive that I’ll use it as much as I think? If I don’t bring it, will my trip be substantially worse? Do I use this every day at home? Standardize on batteries and cables. Use interchangeable plugs and cables (for example, I have this dual USB adapter) to charge your devices, rather than a specialty one for each device. To the degree you can, get devices that run on standard size batteries so you can just buy new ones rather than having to lug a charger. That also helps in case your proprietary battery dies. And use the same size batteries across devices if you can so you can simplify things. Ditch point-and-shoot cameras. Annie Leibovitz recommends the iPhone to a point-and-shoot. So do I. They’re way simpler and more portable, and you can share the photos right away. If you don’t like an iPhone, the one you’ve got will probably do just fine. And if not, I’m revoking your geek card. 😉 If you’re a serious photographer there may be no getting around a DSLR, but these days I often leave it at home unless I know I’ll be going somewhere photogenic. Use the Cloud for everything you can. Yes, cloud security is an issue, but you can find ways around that. Crash Plan or Jungle Disk can replace your portable hard drive for incremental backups. Tablets and smart phones can replace a lot of what you’d need a full size computer for. Google Docs works fairly well for simple editing, and CloudOn is a full-blown Microsoft Office instance accessible through an app. If you ever find yourself seriously in need of a computer, the iPad has apps for that too. Consider LogMeIn to remotely connect back to your desktop at home. Or OnLive Desktop will provide you with a virtual Windows desktop. Get multiple power adapters, rather than one universal one. They’re usually smaller and easier to pack, plus you don’t have to carry them all if you’re not going everywhere. I bring 2 of these small European plug adapters and one of these multi-plug European plug adapters, as well as a 220/240v power converter (make sure you read up on how to use it) for devices that won’t handle that much voltage. Have I missed something that you always take with you? Is there a good idea that you want to expand on? Let me know what you think. For a while I’ve been trying to find a device that will let me track myself wherever I go to map out my routes. Then when I got an iPhone I figured there’d be an app for that. Google Latitude came close, but no cigar. But I’ve found a great one! 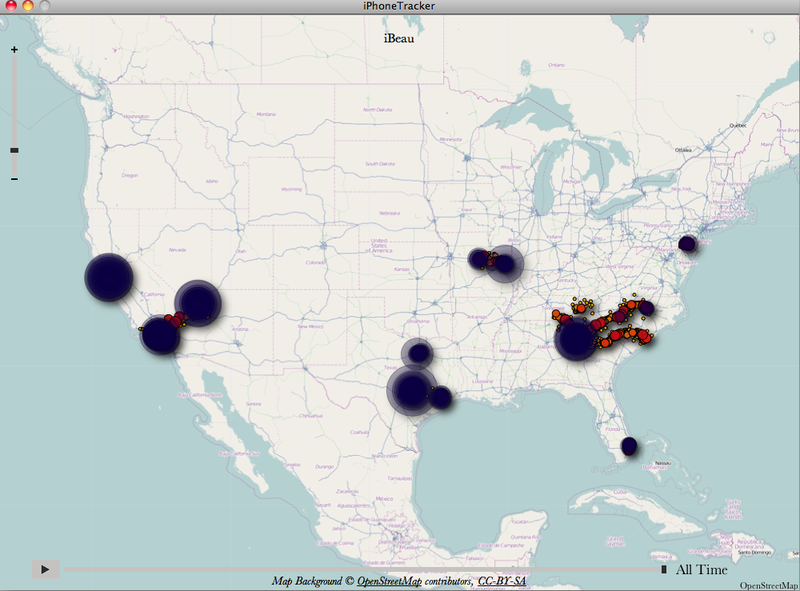 Turns out, my iPhone tracks what cell towers I’m connected to and stores that data on the phone for a year. Well that’s not going to give you GPS-quality coordinates, but it’s certainly enough for me to show a trip I took and map things out roughly. There’s even an app for that (Mac only for now). Here’s where I’ve been in the last year. There’s apparently a similar cell tower log file on Android-based phones too. This information has apparently been known for a while, but was just brought up and publicized recently as a security or privacy risk. But that risk is pretty low, considering that someone would have to already have your phone or computer to get the information. And if the data helps you do something positive, then it’s a pretty cool feature. I’d love to see Apple build out a service or piece of software that would accentuate this! I was on the tilt-a-whirl today. You know, the one that launches you up and around and flips you upside down. Well apparently my phone fell out of my pocket during that time. Spectators said they saw it mid swing. In other words, it launched a few hundred yards. Yeah, it’s bad. Luckily it landed softly in the water. Yeah, that’s bad too. The up-shot is that I found it. Or rather the guys who run the ride found it. They held it in a towel so it wouldn’t drip all over the place. It’s drying now. So I guess what I’m trying to say is that if you called me in the past day, understand if I don’t answer. You can use the iPhone as a map, even when you have no cell service. This is a trick I used abroad when I was going to a new country and knew I wouldn’t have a new SIM card before I needed to get somewhere. The trick is, you have to preload the maps. The easiest way to do this is to pre-plan your route before you set off. From the train station or airport to your destination. Then you can scroll around a bit and download those maps. I usually like to zoom in or out just a bit and try and load as much of the map area as I can to help me out. I wouldn’t use this as my sole means of getting to where I’m going, but it’s pretty handy in a pinch! When I get to where I’m going I can then access those maps even without a SIM card in the phone. This trick works even if you turn the phone off and back on and it should survive playing music and things. But don’t load other places in the map – you might lose some of the data you need. Also, the GPS is kind of spotty some places in Europe, and without Internet connectivity you can’t use the wifi or cell tower location services. I’ve jailbroken my 3G iPhone so I can use it in Europe. AT&T can’t seem to figure out how to make their service work over here (no matter how many times I call and they tell me I’ll be able to use it) so I took it upon myself to do it. With the tools from the iphone-dev team it’s a snap. 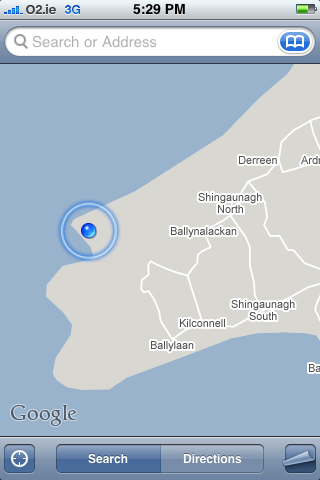 Turns out the iPhone works great here. It will even do WiFi channels 12 and 13, verboten in the US, but loved by the Euros – possibly because our eqiupment can’t pick them up. Who would have thought Europeans would be exclusionary? So while the cafes and hotels are unapologetic to the legions of North Americans (yes, Canada, you’re screwed too) who can’t connect, I surf happily, albeit limitedly. The first thing you’ll need to do when you get here is to grab a new SIM card. Check rates before you arrive and you can probably grab your choice at the airport in many cases. But keep in mind that roaming to a different country can get expensive, so don’t put a lot of money on the card unless you think you’ll use it all in that country. Since data and calling costs vary from country to country, you’ll have to figure out how much is right for you. There are also some quirks to European networks. For example, it’s cheaper to call the US than Ireland from some Irish carriers like Vodaphone. Here’s another quirk: The O2 network in Ireland will charge you between twice and infinitely as much as you should pay. After “topping up” (adding money to the SIM) by 10 Euro, I visited the O2 website – 100kB, according to O2 themselves – and all my credit was gone. After topping up again, I used 5 Euro while my phone was off. Something I’ve run into here a couple of times is that the SIM cards don’t work on the iPhone for data. I finally figured out why and after a few configuration changes, I was up and running. It turns out that there’s something called “APN settings” which consist of an APN name, username and password – all of which are well known, and all of which are different for each network. If you don’t have these, you can’t get online. There are lots of tutorials out there, but most of them are complicated or didn’t work for me. So here’s how I did it. 1. After you’ve got the SIM card in the iPhone, go to Settings -> General -> Network. 2. If you have the Cellular Data Network menu, enter your details there (google for your SIM card’s APN settings if they didn’t come with the package) and you should be set. 3. If you don’t have that, don’t fret. Turn your phone off, put in your old SIM card, and power it on. You should now have the menu. What use is the menu on the old network? 4. WARNING: RISK INVOLVED. But I’m guessing if you’ve jailbroken your iPhone you don’t care about that. So pop out your old SIM while the phone is still on and replace it with the new SIM card. 5. Configure your new SIM’s APN settings – you should see the 3G icon appear. If not, you may have to restart your phone. 6. Now you should be on the Internet! Impress your friends and the locals! 7. Don’t contact me if you have problems, this worked for me and that’s all I know. FYI, for a pay-as-you-go SIM card on O2 UK, you have to change the APN to payandgo.o2.co.uk – leave the login and password the same (vertigo/password). My iPhone‘s vibrate feature broke. Now it just rattles. I bought a new one and when I got my first call…the vibrate feature didn’t work. So I swapped it for a new one and tested it in the store.